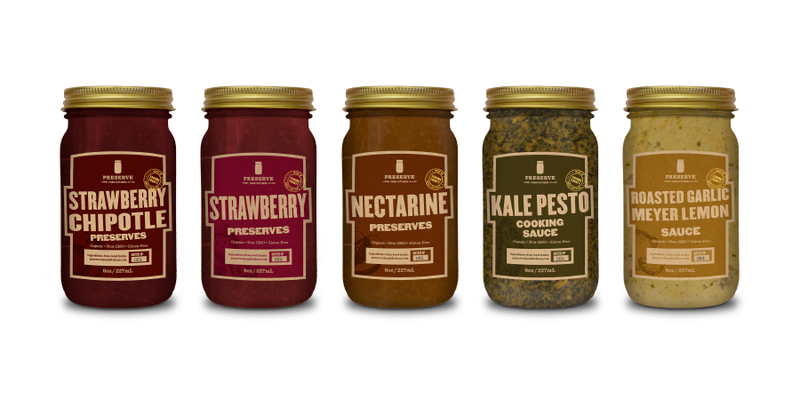 The goal with Preserve Farm Kitchens’ new line of sauces and preserves was for the label system to be both flexible and retail-ready. Each sauce is made from unwanted or “ugly” produce from local farms that would otherwise go to waste. Our thought was that when it comes to pasta sauce, most buyers buy strictly on either habit or flavors and inclusions. You either buy what you know, or you buy something that has appetite appeal. We took this opportunity to create a die-cut label that would allow us to use large typography to our advantage to catch the eye of the grocery buyer. This was something we saw was lacking in the pasta sauce aisle, as most brands tend to whisper, so we wanted to shout. Each label uses an illustration in the background of the primary ingredient to add some visual texture. And the color of each label is derived from the actual sauce itself, creating a full color flood effect on the primary display panel.